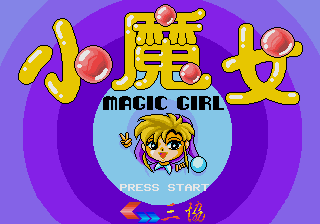 Xiao Monv: Magic Girl (小魔女 Magic Girl) is an unlicensed shoot-'em-up for the Sega Mega Drive developed by Gamtec in 1993 (according to the game credits). Super Fighter Team acquired full copyright to this game and released it worldwide in 2015.
shoots (hold for rapidfire). launches a bomb, which you have a limited supply of (look at the star icon in the HUD to see how many). Whether or not does anything is unknown. Powerups and shields are dropped by yellow clouds. Unlike most shoot-'em-ups, you have a health meter that goes down every time you take damage; when it empties, you lose a life.